Best Friends for 30 years! Yvonne: Yes, we are royalty! And that’s the way we were treated during our whole stay. Thank you, Clayton for laughing genuinely and heartily at our joke! We ordered dinner…Yvonne and I agreed that we had never had a chicken salad sandwich quite so delicious. Served on crescent was a mixture of finely diced chicken that had been marinated with rosemary, tossed with fennel, dried apricots, celery, and a honey aioli (Yvonne, you will be quizzed on this word at a later date) base. Our sandwiches were served with a chilled fruit cup of melons, pineapple and strawberry, perfectly cut and fresh from the farmers market next door. Yum! Ordinarily we would have opted for a box, but not this time! Obviously, we were not concentrating on our diets. Our room was fabulous and had everything we needed. The next morning we enjoyed a ‘made-to-order’ breakfast. Chrissy was our wonderful waitress, James and Ethan our willing chefs, and Jennifer mirrored Clayton’s fine example as we checked out. I must make mention that this hotel prides itself in being ‘green’ making great efforts to help the environment. This building is certified by Project Leed and the US Green Building Council. Kudos for that! 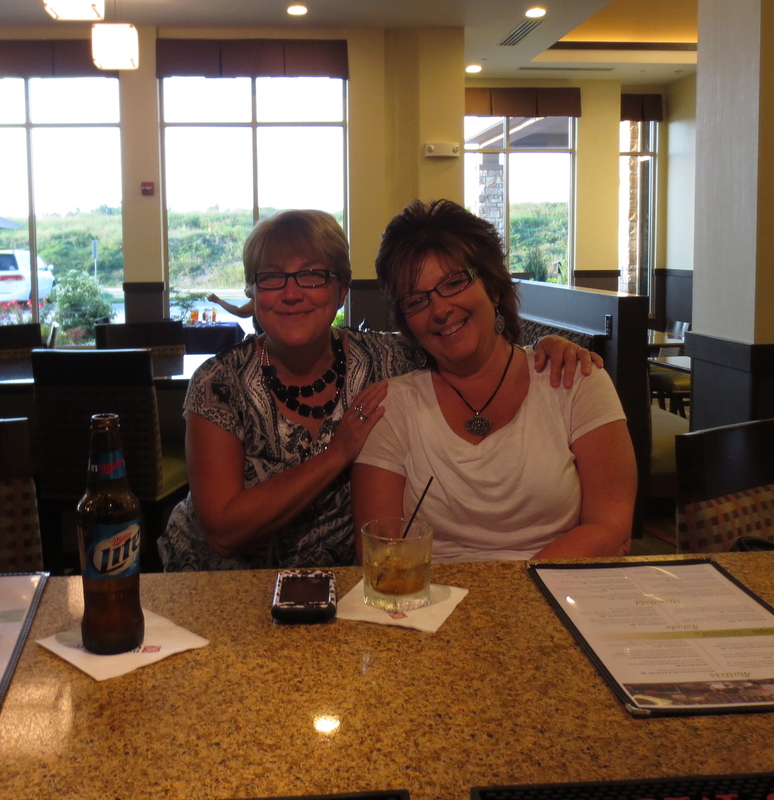 Yvonne and I would certainly recommend the Garden Inn Hilton for anyone who is traveling through Springfield, MO, especially those who need slumber after navigating the twists and turns of the great Route 66. Visiting our sons at college and touring the Mother Road provided us the opportunity to live it up in true royal fashion! This is a great beginning to my travels on the famous Route 66. While I won’t be able to travel all of it, I most certainly will try to share much of its history and existing structures with my followers….PS Did you get your kicks today? Side note-my apologies to any staff member that I forgot to mention or if I misspelled a name. It goes without saying that there are many folks who made our stay enjoyable – including house keeping, dish washers, grounds keepers, etc. The behind the scenes staff is just as important! Lights turn on when you walk down the hall. Country music with the press of a button! Just a little night cap. Aside | This entry was posted in Dining, Journal, Lodging, Off the Road, Route 66 and tagged chicken salad, Drury, Garden Inn Hotel, Go Green, Hilton, Jack & Coke, Miller Lite, Mother Road, MSU, Project Leed, Route 66, royalty, USGBC. Bookmark the permalink. You and Yvonne are so blessed to have each other. One of many destinations in our adventures! Thanks for going off the beaten path!! We had a blast. On our way back home we got off the road a few times to travel parts of Route 66. Will share the pics, etc. in other posts under that category.